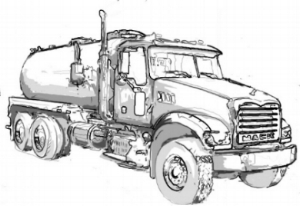 FLUID TRANSPORTATION — Three Rivers Trucking Inc.
All Vacuum Trucks come with fully competent operators and vacuum pumps to satisfy your fluid transport needs. We equip all vehicles with standard 3 inch connections. For special connections or fitting please let us, we would be happy accomodate your needs. 80 bbl. Fluid Transport Vacuum Trucks- These smaller, more maneuverable trucks are for rough hard to reach areas. They also excel at servicing small or congested location such as active frac jobs, compressor stations, gas plants and new construction. 130 bbl Fluid Transport Vacuum Trucks- These larger trailer mounted tankers are used for moving large amounts of fluids. All trucks have a vacuum pump to both load and offload fluids in an efficient manner. The tanks used are coated to allow the transport of many different types of fluids. This type of service is mainly used in the oilfield for transporting water to and from location as the needed.